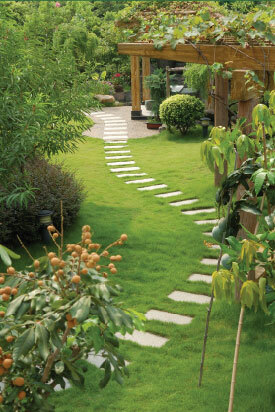 Many people see spring as the beginning of the gardening year, and it’s the perfect time for a garden makeover. Any improvements you make now will get the new season off to a great start. De-clutter: Resolve to get rid of anything you no longer want or need, but think green and recycle as much as possible. You might be able to sell or give away play equipment that your children have outgrown, building materials left over from DIY projects, even that wheelbarrow with a wonky wheel … Your junk could be someone else’s treasure and just think of the extra space you’ll have! Make a new lawn: Most lawns can withstand a lotof wear and tear but eventually the damage takes its toll. If your ‘lawn’ has become a rutted patch of weeds replace it with fresh, top quality turf for an instant green carpet. Coordinate your containers: Most keen gardeners have a collection of assorted plant containers that they have acquired over the years. Pots, tubs, boxes and troughs in a variety of different shapes, sizes, colours, styles and materials can all be useful, but when clustered together on the patio they might not give the overall effect you were hoping for. There is a place for a pink plastic flowerpot in the garden, but it probably isn’t next to an antique stone urn. If you don’t want to buy a complete set of new containers try rearranging the ones you already have into groups that do look good together. You can paint wooden planters in the same or toning colours, and instead of trying to hide a single ‘odd’ pot you could make a feature of it. Be ruthless: Unfortunately, plants don’t last forever. If some of yours are past their prime they might not be worth cosseting for another year. Try taking cuttings from a favourite plant so you can replace it with a vigorous new offspring. Otherwise, get rid of mediocre plants that are taking up valuable space and treat yourself to something different that you’ll really be proud of. Add a focal point: If the first word that springs to mind when looking at part of your garden is ‘boring’ give it some interest in the shape of a statue, sundial or water feature. When you start improving your garden one idea will often lead to another, but tackling all those jobs is a different matter. If you need advice and help with some of the bigger projects, ask for a free, no obligation consultation from a professional landscape gardener who can turn those ideas into reality.